Reverend Robert Lee Spicer, Sr., is a native of Dawson, Georgia. On June 25, 1994 he married Chandra Lewis Spicer of Atlanta, Georgia. They are the proud parents of two children, Robert Lee Spicer, Jr. (age 19) and Chanice Nicole Spicer (age 13). Robert received his public school education in Dawson, Ga. He attended Albany State University and Georgia Southwestern University where he graduated with a Bachelor of Science degree in Psychology with a minor in Chemistry. In 1994 he earned a Masters of Divinity degree, with a concentration in Christian Education, from The Interdenominational Theological Center in Atlanta, Georgia. In addition, he has an earned Doctor of Ministry degree from South University. He is also a graduate of the Southwest Georgia Regional Police academy, Army ROTC, Engineer Officer Basic Course, and the Army Chaplain School. Reverend Spicer received his call to the ministry in 1990 as a member of Jordan Grove Missionary Baptist Church in Leesburg, Ga. He was licensed to preach in 1990 and Ordained in 1995. From June of 1994 to March of 2016, he served as pastor a pastor in the United Methodist Church of the Alabama-West Florida Conference. 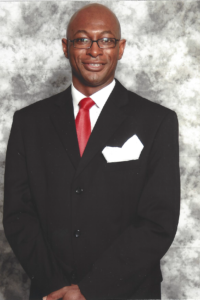 He has also served as the Director of the Tuskegee University Wesley Foundation. He is the founder and director of Southern Regional Christian Academy- a private high school. Within the Alabama-West Florida Annual Conference Robert has served on the District Committee on Ordained Ministry, Children’s Home Board of Directors, Conference Board of Ordained Ministry, 2000 Alternate Delegate to Southeastern Jurisdictional Conference, 2004 Delegate to General Conference, Board of Directors Alabama State University Wesley Foundation, Director of Continuing Education for the AL-West Florida Conference and has served in numerous other capacities. Recently, he was elected as a 2008 Southeastern Jurisdictional Conference Delegate. At the local church level Reverend Spicer has been very intentional in nurturing and developing congregations. Some of the ministries that have been established in churches under his leadership include: Child Development Center, Bowen Economic Development, Inc., Southern Regional Christian Academy (a night high school), After School Programs and Summer Academies (elementary and junior high). Reverend Spicer attributes much of the work to intentional Bible study participation and active prayer ministries. He has been intentionally involved in church growth and new church development work for the past ten years. Robert has been involved in several community organizations by serving on the board of directors for Habitat for humanity and Vice-President of the Tuskegee Interdenominational Minister’s Council, and Chaplain for the Tuskegee Police Department. He has served in several leadership positions as a member of Alpha Phi Alpha Fraternity Inc.